For an old film, this one sure is good. Well, there are some not-so-good shots. Like that creepy close-up of that old man's face. And when they raised their hands to vote. But this was made in 1957, so you can forgive director Sidney Lumet, since the cinematic language was kind of different back then. But the storytelling was perfect. Which goes to show that great stories are timeless. The musical scoring was good, but again, it makes the film sound really old. I don't think anybody uses that kind of scoring anymore. But then again, this was in 1957. The acting was great. Henry Fonda was in it. I thought he was Jack Lemmon. Turns out Lemmon was in the 90s remake. Anyway, great job for the casting director. 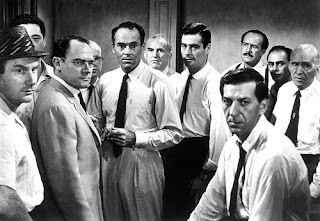 The actors faces matched their characters perfectly, from the juror who grew up in the slums, to the dorky juror in glasses, to the angriest juror of all. Just casting the correct actor is already half the job done. The film's pacing was well-done. It rises, then steadies, then sinks, then rises again. Just like a real courtroom drama. Only this one was not in the courtroom. But it was still a court-related proceeding. Too bad we don't have juries in the Philippines. Or maybe that's a good thing. I don't really know. And I don't really care. 12 Angry Men. USA. 1957. Casting: Nine out of ten.